While most of us know that our future success in in our own hands, we cannot shape our future literally using them. It is but for a few of the artistically talented , to have the capacity to do exactly that. 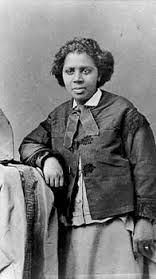 In 1845 Mary Edmonia Lewis was born in New York to a black father and a Chippewa Indian mother.In 1859 she entered Oberlin College in Ohio, where she was accused of giving two girls an aphrodisiac that caused them to get sick. Although the allegations were never substantiated , Ms Lewis was forced to leave Oberlin without having completed her final term. Ms. Lewis moved to Boston where it is said that she began her sculpting career by completing a bust of John Brown. She also completed a bust of the famous leader of the all black 54th Massachussetts Regiment Col. Robert Shaw. She made her way to Rome in 1865, using her earnings from her previous works. It was in Rome where she developed what is known as a “neoclassical style.” Although she broke away from that style when she created “Forever Free”. This work of hers was in celebration of the Emancipation Proclamation. She created many other notable works including “The Death of Cleopatra”, “The Old Indian Arrowmaker”, and Hygieia. She spent most of her life seeking acceptance as a black female artist. Her works express her thoughts on the position of women, Blacks, and Native Americans. What can you create with your hands?